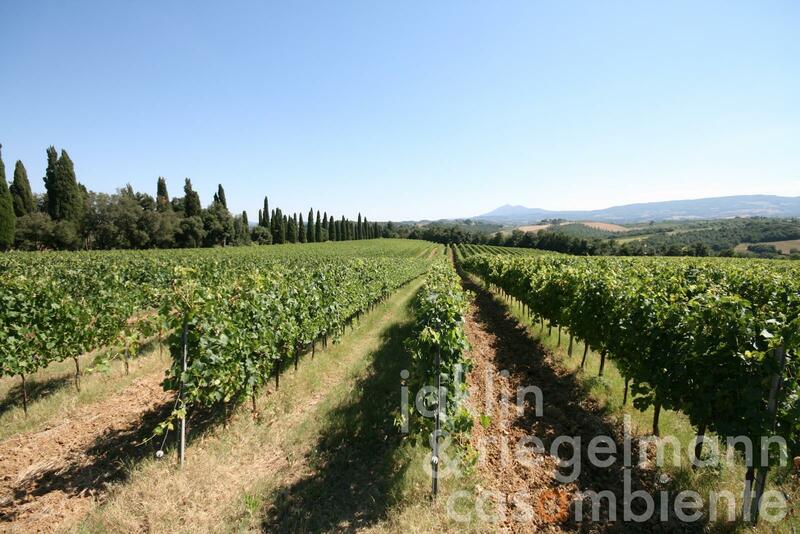 Tuscan Vino Nobile di Montepulciano DOCG winery for sale with 28 ha vineyards and 6 ha olive groves on about 70 ha of land. The winery is one of the best and well-known producers of the famous wine Vino Nobile di Montepulciano DOCG. A total of 6 ha were replanted in 2013, with 22 ha currently being in full production. About 20 ha of additional vineyards could be planted on the property. The existing 28 ha of vineyards comprise the following quantities and grape varieties: 12 ha Sangiovese (planted in 2003, 4,500 vines per ha), 6.3 ha Sangiovese (planted between 1970-1992, 3,500 vines per ha), 2 ha Merlot (planted in 2003, 4,500 vines per ha), 1 ha Colorino (planted in 2003, 4,500 vines per ha) and 0.7 ha Cabernet (planted between 1970-1992, 3,500 vines per ha). The buildings comprise a wine cellar on about 1.500 m² with state-of-the-art machines and equipment, wine storage on about 600 m², country house with about 250 m² and two apartments, rustico with about 250 m² to restore as well as a former stable building to restore. In addition, the winery owns spectacular tasting and show rooms in the historic centre of Montepulciano. The current wine in stock amounts to about 100,000 litres Vino Nobile di Montepulciano DOCG, about 30,000 litres Rosso di Montepulciano DOC and about 100,000 bottles of former vintages. 70 ha with 28 ha vineyards and 6 ha olive grove. Electricity, photovoltaic modules, mains water, own well water, central heating, fireplace, air conditioning, gas connection, telephone, broadband internet access, alarm system, private parking, terrace, vineyard, olive grove, garden.